Al-Nasir Salah El Din Yusuf ibn Ayyub or Saladin was born in 1137. He was the first sultan of Syria and Egypt and he was the founder of the Ayyubid Dynasty. He was able to lead the Muslim military against the Crusader states in the Levant. His sultanate included Egypt, Syria, the Hijaz, Yemen, Upper Mesopotamia, and other different parts in North Africa. 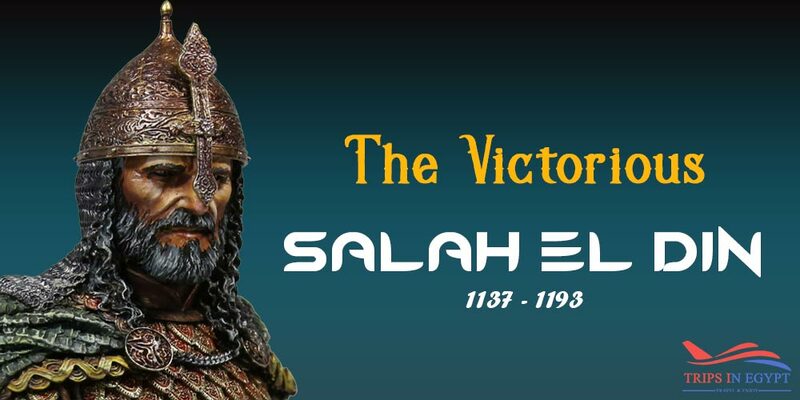 Salah El Din was a great political leader whose greatest triumph came at the Battle of Hattin in 1187. He became a legend in the east and the west as he cleared the Crusaders from Jerusalem. He rose a new unified Islamic state centered in Egypt. Saladin was born in Tikrit. His name was ‘Yusef’. His uncle Asad al-Din Shirkuh was the one who was responsible for teaching Salah El Din all of the military strategies. Following the orders of sultan Nor-Din, Salah El Din at the age of 26, was sent with his uncle Shirkuh to Fatimid Egypt in 1164 to consolidate Shawar through his power struggle with the teenage Fatimid caliph Al-Adid. The role of Salah El Din was small as he had only to collect stores from Bilbais before they were siege by a combined force of Crusaders. However, when the army of Shirkuh engaged in a battle on the desert borders of the Nile River, Saladin played a major role and command the right wing of the Zengid army, while commanding a force of Kurds from the left, and Shirkuh was stationed in the center of the army. Saladin was known with his kind treatment with his enemies and that was the main reason for gaining the respect of his enemies especially Richard I. He was known with his virtue of his military successes against Crusader assaults. He also had a personal closeness to Al-Adid. After the death of Al-Adid in 1171, Salah El Din began to undermine the Fatimid establishment and he abolished the Fatimid Caliphate. He realigned the country’s allegiance with the Sunni, Baghdad-based Abbasid Caliphate. After some years, he was also able to lead the forays against the Crusaders in Palestine. This was followed by a successful conquest in Yemen and he staved off the pro-Fatimid rebellions in Upper Egypt. Nur El-Din wrote to Salah El Din asking him to reestablish the Abbasid caliphate in Egypt. He could coordinate it after two months with the encouragement of Najm ad-Din al-Khabushani. Al-Adid fell ill and he asked Salah El Din to take care of his children but Salah El Din refused to fear that he may arrange treachery against the Abbasids. Al-Adid died on 13th of September and Saladin had regretted his action. On September 25th, Salah El Din joined the attack on Kerek and Montreal with Nur El-Din, who would attack from Syria. Salah returned to Cairo and left Nur El-Din alone as he knew that the Fatimid Empire wanted to have power again over Egypt through his absence. Salah El Din’s father died On 31 July 1173 after wounding in a horse riding accident and in 1174, Saladin sent Turan-Shah to conquer Yemen to allocate it and its port Aden to the territories of the Ayyubid Dynasty. Salah El Din used the wealth of Egypt for the conquest of Syria, that of Syria for the conquest of northern Mesopotamia, and that of northern Mesopotamia for the conquest of the crusader states along the Levant coast. The activities of Saladin involved fighting other Muslims from 1174 until 1187, which put Aleppo, Damascus, and other cities under his power. He established the Ayyubids Dynasty in Egypt, Syria, and Yemen. When Salah El Din gained victory over the Zengids, he proclaimed himself a king. He suppressed the name of Al-Salih in Friday prayers and Islamic coinage and ordered prayers in all mosques in Egypt and Syria. After that, he headed to Aleppo and on the way his army took Buza’a, then captured Manbij. An assassin attacked him and tried to kill him but Saladin could grab his hand and saved his soul so he hurried his forces to Aleppo to punish Gumushtigin. He even sought to form an alliance with Sinan and his Assassins. Salah El Din returned to Cairo and he has such magnificent achievements. Outside Cairo, he established the large bridge at Giza. He built colleges such as the Madrassa of the sword Makers. He also ordered the internal administration of the country. King Baldwin sent messengers to Saladin in 1180, asking him to stop the war and to live in peace. Saladin agreed on the treaty, as he was afraid of drought. He attached several cities of Sinjar, Beisan, Beirut, as well as Kerak, capturing them easily with his forces during 1182-1184. In the following year, he got into the Battle of Hattin and he won over the Crusaders. King Richard “the Lion Heart” tried in 1189 to conquer the Jerusalem Kingdom for the third time. Richard with his army and the Abbasids faced each other on September 7, 1191. The Abbasids did their best and made the Crusaders lose all of their chances to get Jerusalem. Salah El Din constructed this gorgeous citadel in 1176 A.D. He ordered his vizier Bahaa el-Din Karakosh to destroy all the buildings and tombs in the location in order to construct such a marvelous citadel. Salah El Din Citadel is located now in one of the most important touristic destination in Egypt between the Egyptian Museum and the Sultan Hassan Mosque. There are many important attractions inside the citadel like Mohamed Ali’s Mosque. There is also Qasr el-Jawhara, which carries a great history that dated back to the massacre of the Mamluks by Mohamed Ali, you can explore the great citadel of Saladin in Cairo through our magical Cairo day trips. Salah El Din died in 1193 of fever in Damascus. He gave all his fortune away to the poor. Pope Innocent III inaugurated the 4th Crusade after the death of Salah El Din but they couldn’t defeat Salah’s great empire. It’s time to visit Egypt and Explore the historical sights of Pharaoh, in addition to, explore the beauty of the Red Sea through our magical Egypt tour packages, check our tours and choose a splendid trip to Egypt.